DUMBARTON shocked Championship side Greenock Morton in the first round of the Irn-Bru Cup at the C & G Systems Stadium. DUMBARTON shocked Championship side Greenock Morton in the first round of the Irn-Bru Cup at the C & G Systems Stadium with a deserved 2-1 win. Sons started the game well, and within 12 minutes found themselves in front. Michael Paton fired in to make it 1-0 to the home side after Iain Russell's close range effort was blocked, following fine work from Bobby Barr in the build-up. Barr was again the architect when Dumbarton increased their lead to 2-0 on 26 minutes. His cross was met by Ryan Thomson, then latched on to by Russell, who finished clinically (pictured). However, Gary Oliver pulled one back for Morton with a good finish from 18 yards six minutes before the break, making it 2-1 at half time. At the start of the second half striker Rory Loy replaced defender Craig Barr, as Sons enjoyed some early chances and the men from Greenock started to push back again. Keeper Grant Adam made several great saves to keep the visitors at bay when the game moved into the final stages. Thomson also made two vital interceptions in a row as Morton broke fast on 90 minutes. 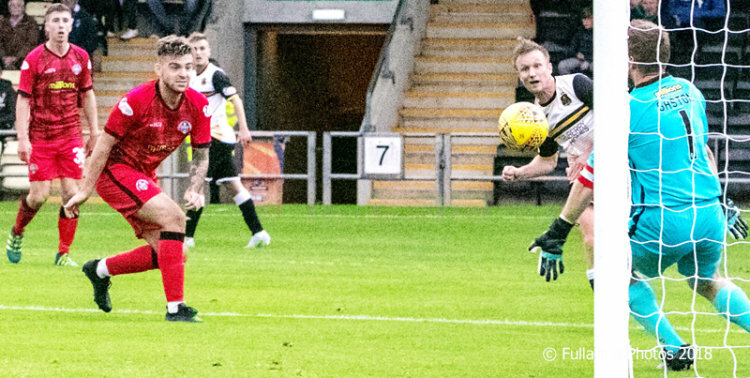 In the end Dumbarton hung on to a deserved lead to claim a morale-boosting win over their local rivals in an absorbing Irn-Bru Cup first round south clash.